Stretch Your Way To Better Golf! Flexibility is the buzzword in the golf world! The more flexible a golfer is the better chance he/or she has at making an optimal backswing, and producing maximum clubhead speed. There is still some controversy over which flexibility exercises are the best for golf and how often you should stretch. Knowing your limitations going into a stretching program is very important. If you have joint or muscle limitations, you should see your doctor before you start. Flexibility training should be done consistently (daily) to obtain significant improvement. 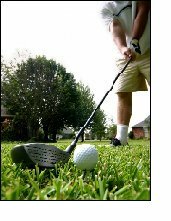 As we get older, flexibility becomes a greater issue when attempting recreational activities such as golf. Follow the guidelines I have written below, and you will get the most out of your flexibility program, and play your best golf! A warm muscle is much more easily stretched than a cold muscle. Never stretch a cold muscle; always warm up first to get blood circulating throughout the body and into the muscles. A warm-up should be a slow, rhythmic exercise of larger muscle groups done before an activity. Riding a bicycle or walking works well. This provides the body with a period of adjustment between rest and the activity. The warm-up should last about 5-10 minutes and should be similar to the activity that you are about to do, but at a much lower intensity. Once you have warmed up at a low intensity for about 5-10 minutes and have gotten your muscles warm, you can now stretch. We recommend stretching both before and after exercise, for different reasons. Stretching before an activity (after the warm-up) improves dynamic flexibility and reduces the chance of injury. Stretching after exercise or golf ensures muscle relaxation and facilitates normal resting length, circulation to joint and tissue structures, and removal of unwanted waste products, thus reducing muscle soreness and stiffness. Body temperature is highest right after cardiovascular exercise or after strength training. In order to achieve maximum results in range of motion and other benefits, it is highly recommended that you do static stretching at this point in your workout, just after your cardiovascular program and during or after your strength-training program. Stretching before golf should be part of your warm-up. Active or dynamic stretching is crucial in preparing a golfer to perform at their best. Warming up first is essential. Your core body temperature should be raised to avoid injury. This can be done by walking from your car to the practice range at a fast pace, thus preparing your body for active warm-ups specific to golf. The shoulder joint is the most active joint in the golf swing. Movements such as arms circles and crosses are needed to prepare for an aggressive golf swing on the first tee. The hamstrings and low back are also critical areas to warm up before swinging a club. Doing some easy toe touches (ease into it) with slightly bent knees will adequately loosen up your lower back and hamstrings and provide more freedom in your golf swing. Most golfers head for the clubhouse after the round. This is a crucial time for stretching because you have just put your body through a lot of stress. Spending only 5 minutes after the round doing static stretches will prevent a lot of soreness and tightness. The areas to concentrate on are the low back, hamstrings, hips, and shoulders. If done consistently, you will be able to play or practice the next day with very few residual effects. To improve functional flexibility, we recommend stretching the muscle being worked in between strength-training sets. The benefit: maintaining and improving full range of motion while muscles are recovering. This is a very time-efficient method because by the time you have gone through each of your strength-training exercises; you will have stretched each muscle without taking-up any more time. Golfers are very concerned about losing flexibility from strength training. This is one way to ease your mind about maintaining full range of motion, even while strength training. Applying all of these principles will allow you the best chance at improving your flexibility and ultimately your golf game! For more information on how to improve your golf game, visit www.golf-trainer.com for customized golf fitness programs, video demonstrations and instructions, and UNLIMITED golf fitness consulting!